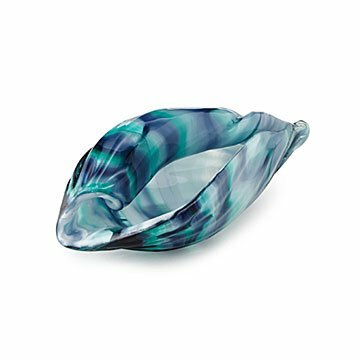 Michael Hudson's hand-blown glass sculpture embodies all the seashells you’ve collected, in elevated form. Michael Hudson's stunning sea life sculpture is an elevated embodiment of all the shells you've collected since childhood. Hand-blown from green, blue, white, black, and clear soda lime, its extraordinary layers of color form as the glass is fired. While it's still hot, Michael and his assistants fold and twist it into its graceful, ridged seashell shape. Place it in front of a window, and it'll tint the sunlight passing through. There's even room inside for little hidden treasures of your own. A special gift for ocean enthusiasts and lovers of beautiful art glass. Handmade in Kentucky.